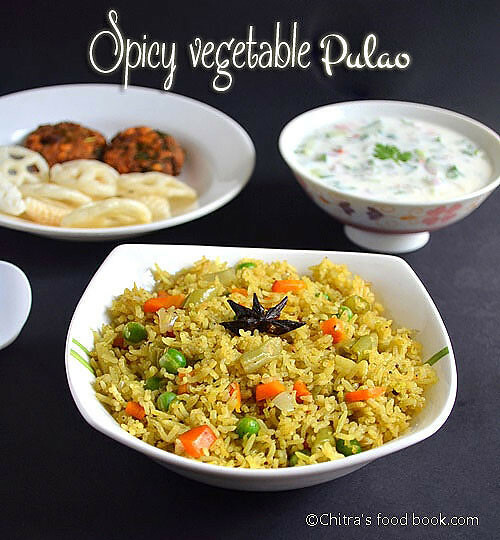 I got this restaurant style veg pulao recipe from a friend who is an expert in cooking non-veg recipes.She shared her South Indian style Vegetable pulao recipe with me. In Karnataka, all my friend call it as vegetable pulao/palav. In my house, mom and MIL call these kind of recipe as either biryani or vegetable rice.I tried this recipe for the first time.It came out super flavourful and tasty.When you cook this biryani, I bet your house will be scented with this masala flavour.U can feel the smell in your hands even after you finished eating it:) I am not exaggerating, its true. Try it :) Its totally my kind of recipe with full masala flavour. Whenever my neighbours make biryani, I keep sniffing the aroma. Every time I feel like rushing to their house to get the recipe.As they cook mostly non-veg biryani, I hesitate to ask because I was thinking the same flavours cannot be achieved with vegetables. I thought its only because of chicken or mutton. Of course chicken/mutton may also be one of the reasons. But the major thing is the masala/spices we use. I got to know this only after making this biryani. U’ll get the taste and smell of non-veg biryani when u try this recipe. If u make this for parties, make it directly in electric rice cooker like i did in my tomato rice recipe but with generous amount of oil and ghee. Rice cooker helps to keep the pulao hot till u eat. Last week i attended a birthday party.They kept this rice in their menu. It was awesome.So I thought of sharing this recipe before posting the party menu. Wash and soak the basmati rice for at least 30-45 minutes.Else u have to add 2 cups of water for 1 cup of rice.Chop all the vegetables and onions(finely) & grind the masala.Keep it ready. Add turmeric and red chilli powder.Saute for a minute.Lastly add the vegetables and required salt.Mix well.Drain the water from the soaked rice and add it.Mix well for a minute. Lastly add 1.5-1.75 cups of water(depending on the brand) and a tsp of ghee and pressure cook in low flame till one whistle or 10-12 minutes. Remove,mix with a fork like ladle. Serve hot with any raita.I served with mixed vegetable raita and its recipe follows. Do not add more mint leaves and onion than the above mentioned quantity. Do not use turmeric powder to get white colored pulao. Add more green chillies if u want too spicy. Add oil/ghee generously when u make for parties or guests. If u have Lichen or Black stone flower - Kalpasi,please add it.Mostly U’ll get this ingredient in biryani masala packet.It gave a nice smell to the pulao. Please click this link to see the picture of this ingredient. Skip if u don’t have it. Adding water depends on the amount of soaking.If u soak for one hour,add 1.5 cups of water.Here I used around 1.75 cups of water after soaking the rice for about 15 minutes as my husband likes that way.I used India gate basmati rice. This raita was served along with this pulao in that party.It was a nice combo for this pulao.We loved it. Finely chop all the vegetables.Mix well in a big bowl adding the required salt.Just before serving add the curd,Mix well without adding water.Tempering is not needed.Serve with pulao/biryani. Cucumber will leave water and the mixture will become watery if u mix curd in advance.So add curd only 10 minutes before serving.After mixing,if u feel the mixture is too thick, add little water.Else do not add water. I just love biryanis, this is sure I can have to go please. Very spicy n hot luking biryani....n raita is very tempting.. Thank you for sharing this biriyani/pulao recipe. Made it and love both the taste and the fragrance. Just one question, since you don't fry the onion until golden, would it be completely cooked? Since I was unsure, I cooked it completely before adding the paste. Nice clicks. Can make out seeing the rice, that it is right texture, which can be had only with use of right measure of oil, ghee and water. It tempts me to try using the Lichen next time to get the aroma. I used to think Saajeera gives the aroma. It will be nice if someone shares their recipe which calls for different combo of masala uses, specially saajeera which gives a sweet smell. thanks for sharing. Thank you for the delectable recipe! much appreciated! Hi mam, shall we add capsicum also and make this pulao?